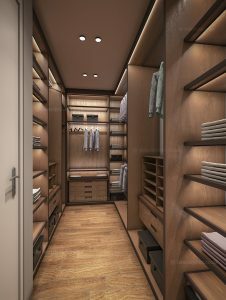 Are you thinking about getting a walk-in wardrobes to add a bit of sleek feel to your dressing-up morning and evening? If you do, then, let me reveal some features of bespoke walk-in wardrobes that you might be interested in. Windows are not a must in walk-in wardrobes. Even you have a corner or a room that does not have any sunlight with careful planning it can be transformed to a bright and light storage space and qualitative modern light system will make the room full of light. Some seating space is an element that often is very useful in the walk-in wardrobe. It can be a chair, a tufted ottoman, a sofa, it can not only be a design feature but will also be used often to sit when you put your shoes on, or tights, trousers etc. The walk-in closet does not have to be huge. Even if you do not have a spare room to transform it into a luxurious spacious walk-in closet, unused corner, utility rooms or loft can be redesigned into a bespoke fitted wardrobe. One of the most popular features of the bespoke wardrobe apart from the hanging space if a fitted shoe storage. It can be shoe drawers or shelves with or without doors. Custom walk-in closet can be created as a made-to-measure traditional wardrobe with spray-painted doors and shelving or shaker-style elements. Those also can be modern with eco-leather and metal features, fitted LED lights with movement sensors, push-to-open drawers and contemporary handles. A well designed and organised bespoke walk-in wardrobe can become one of your favourite rooms and add a luxurious feel to your home.